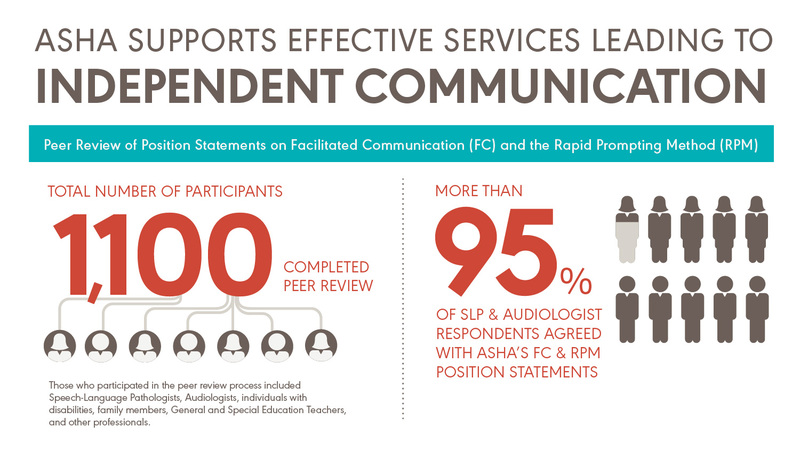 At their August in-person meeting, ASHA’s Board of Directors approved two new position statements regarding use of Facilitated Communication (FC) and the Rapid Prompting Method (RPM). The ASHA Ad Hoc Committee on FC and RPM developed these statements during a year-long process involving extensive study and discussion. The board established the committee in response to member requests urging ASHA to update its 1995 FC position statement and provide guidance on RPM, a similar technique. ASHA’s position is that FC should not be used. Multiple systematic reviews conducted around the world and across decades reveal that the “facilitator” controls the communication, not the person trying to communicate. This statement takes a stronger stance against the use of FC compared with ASHA’s previous 1995 position. “Furthermore, there is extensive evidence of harms related to the use of FC,” according to the official statement. Harmful consequences can include reduced access to effective interventions and denial of the right to independent communication. ASHA’s other new position statement says that RPM is not recommended because of concerns about prompt dependency and the lack of scientific validity. The difference in the statements involves the nature and extent of the available research. Both statements—reviewed by 1,100 SLPs, audiologists, general and special educators, people with disabilities and their families—encourage members to continue helping people with disabilities access independent communication through scientifically-based approaches and methods.